Happy Halloween to you. Eat lots of candy today, mkay? Act like you know more than they do. Don’t listen to their suggestions. Listen to their suggestions, and then don’t do any of them. Don’t take any time to get to know them…and then criticize their performance during the session…then wonder why they don’t seem comfortable. Check your email, Twitter, and Facebook while they’re recording a take. They definitely won’t notice. And you’ll definitely be on your game. If the performance is lacking, have the musician record roughly 17 takes. It’ll be easier to comp together a perfect take than to actually work with them to get one good performance. Make your studio as warm as possible. Sweaty musicians are happy musicians. Just set up mics and press record. Have ZERO input into the creative process. That’s really valuable to musicians. Don’t explain why you’re doing what you’re doing. Make demands. Be as short and snippy as possible. It makes you look professional. Don’t offer any sort of refreshments to the musicians (especially the singers). If they want water, they should bring it. When tensions are mounting, or the recording is getting more frustrating, do NOT offer to take a break. You gotta power through this. While recording one musician, tell lots of stories about other clients you record. Make sure you make fun of them. It’ll make you look cool. Talk about how amazing your OTHER clients are. 15. Don’t have any sort of portfolio of music you’ve worked on. The musicians should blindly trust you, without any proof of your skills whatsoever. If you haven’t guessed yet, this is one of my famous sarcastic posts. Do the opposite of these, and you’ll be in good shape. I’d recommend starting with number 15. Build your portfolio. 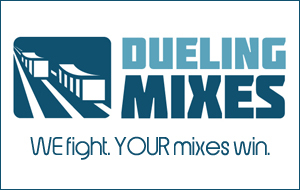 That’s what’s happening inside of Dueling Mixes. There are a TON of people, just like you, who are building their portfolio (AND their ninja mixing skills), one song at a time, one month at a time.